The White Australia policy collectively refers to a number of Australian federal and state policies that intentionally restricted "non-white" immigration to Australia from 1901 to 1973. At the dawn of the twentieth century Australia was a social laboratory. A great experiment was underway to make this new country the most pro-gressive and egalitarian nation in the world. In fact, at the heart of this great, bright experiment lay a dark paradox – the belief that to create a country of such cutting-edge social ideals the population had to be exclusively white. It was a fundamental contradiction that would take almost a century of extraordinary evolution to try to resolve. 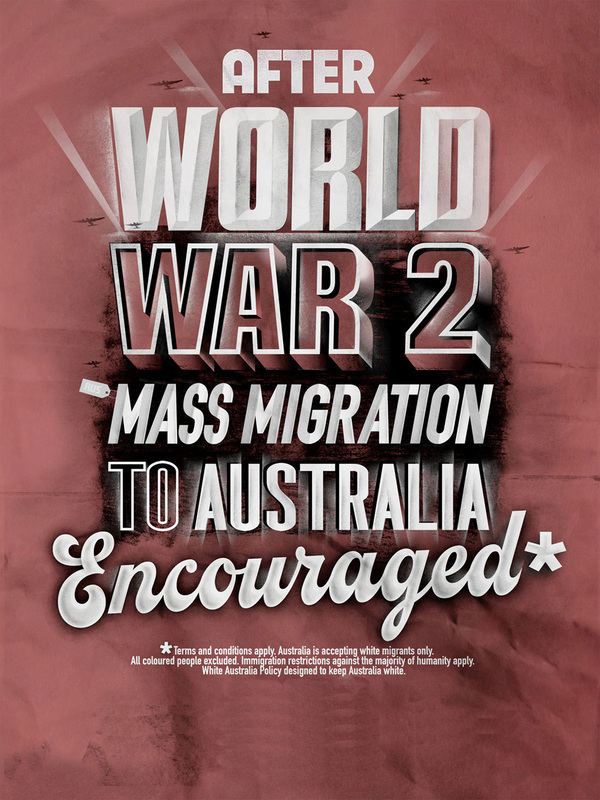 The insecurities of those at the helm meant that at the start of the twentieth century immigration policy was driven by fear and racism, as well as by a vision of being a ‘British’ Australia. As the White Australia Policy was developed and enforced, many of the non-white residents were deported and barred from entry. Vibrant communities were fractured and the Chinese population dwindled dramatically. Fearful for its future and security, Australia embarked on a dramatic immigration program. Migrants from war-torn Europe arrived enmasse. It was social engineering on the grandest of scales. The country would be fundamentally transformed forever. But the gatekeepers to the nation’s borders had to take Australia and its people with them on this radical journey of change. The new arrivals had to be white, and the dream was kept alive through stealth and propaganda. The message was clear: ‘You’re welcome but on our terms and only if you adopt this country as your own.’ It was the age of assimilation. But the world changed and the 1960s brought with it civil rights movements and activism in the United States and beyond. The idea of an exclusively white Australia was questioned from without and within. This was a time when the influence of the immigrant population grew and those in the corridors of power raged against the system and transformed a nation once again. 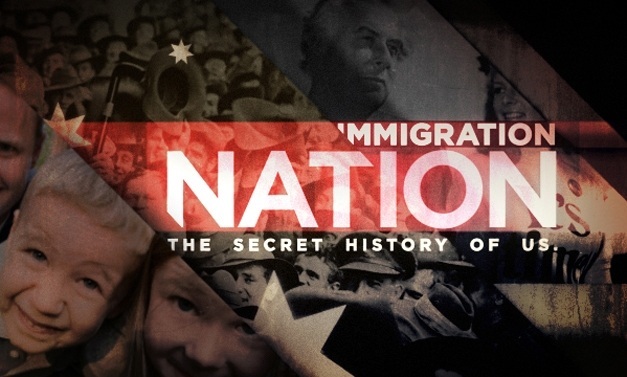 Last year SBS aired a 'feature documentary' called Immigration Nation: The Secret History of Us, the untold story behind Australia’s multicultural mix. It explores Australia’s untold immigration story; a century long struggle to overcome the White Australia Policy that resulted in one of the world’s most multicultural nations. You can watch the first episode through the Immigration Nation website or on YouTube. This is such an interesting documentary I do recommend that you watch all of it, because it offers a great insight into racism in Australia, and many of the issues raised are still relevant in Australia today. But for the sake of the following Task you can get away with just watching Episode 01.
they were so culturally different that there could be no mixing of races, as this would stop the development of a common national identity. To whom did this act apply? What was its main aim? What were its main impacts? What is the explanation offered in Immigration Nation about why the Australian people at that time were prepared to accept such a law? Several parliamentarians spoke against the proposed law and had racial attitudes that were different to those of the majority. Why do you think that ideas of racial equality that we take for granted today did not apply to the societies of 1901 around the world? The 1901 Commonwealth Parliament passed the Pacific Island Labourers’ Act (Number 16/1901) immediately before the Immigration Restriction Act. This was a law to stop the immigration of labourers from the Pacific islands after 1904, and to deport most of those who were already in Australia by 1906. What was the aim of this act? Who would it apply to? In 1919 representatives of many nations gathered to impose a peace treaty upon the defeated Germany and its allies. Australia was represented separately from Britain after pressure from prime minister Billy Hughes. Japan, emerging as a modernised and strong Asian nation, wanted a ‘racial equality’ clause inserted in the constitution of the League of Nations – the new international body created to try to keep peace in the world. What was the aim of the peace treaty? Why did Hughes oppose this? What does Immigration Nation say was the effectiveness of Hughes on this issue? The film draws a connection between this issue and the outbreak of World War Two. Explain this connection. During the 1920s there were various attempts to settle British people in Australia. Describe the scheme referred to in Immigration Nation. Why did it largely fail? What did this scheme show about the attitudes of Australians to race in the 1920s?